The beautiful outline of Mount Etna. Thanks to the hotel's privileged location, the rooms with a view of the Excelsior Palace Hotel face beautiful Etnean sceneries, on the Ionian Sea and on the medieval cloister of San Domenico. The 85 rooms of this historic 4 star hotel in Taormina are large, relaxing and furnished as per the dictates of bio-architecture; distinguished by a sober classic style, they all feature wooden floor and modern in-room comforts. Spacious double room, elegant and comfortable, offers everything you need for a relaxing stay. 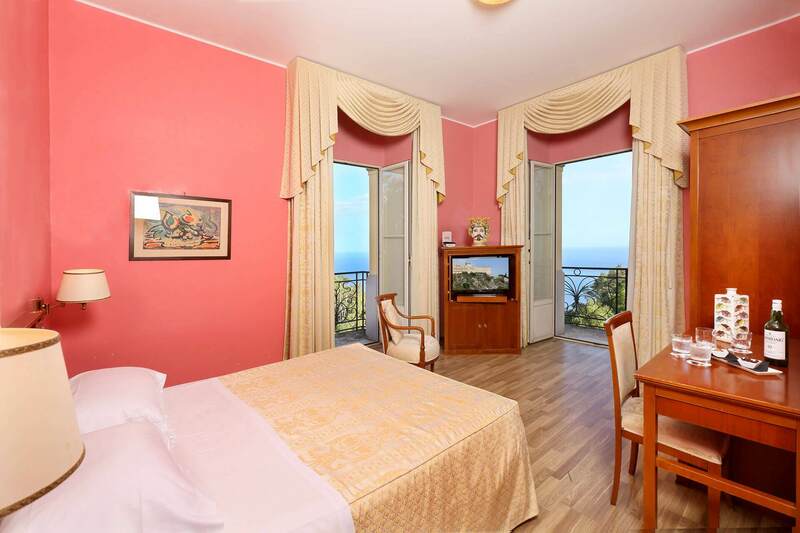 Double room with a window and spectacular view of Etna or the Greek Theater and, laterally, onto the sea. Double room with a French balcony and stunning view of the Etna volcano, and laterally onto the sea. Double room with balcony or window, charming sea view and extra amenities: Argan courtesy line, 40" TV and afternoon refresher. 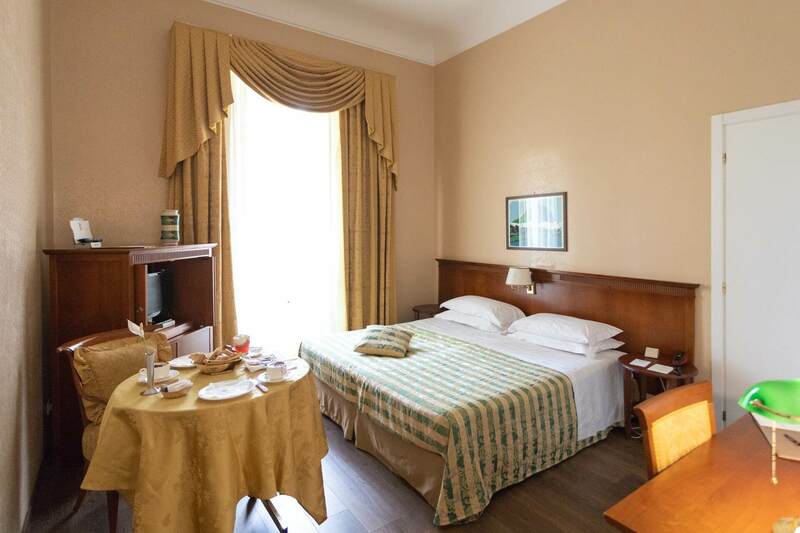 Comfortable room with a large single bed, perfect for guests visiting Taormina on business. 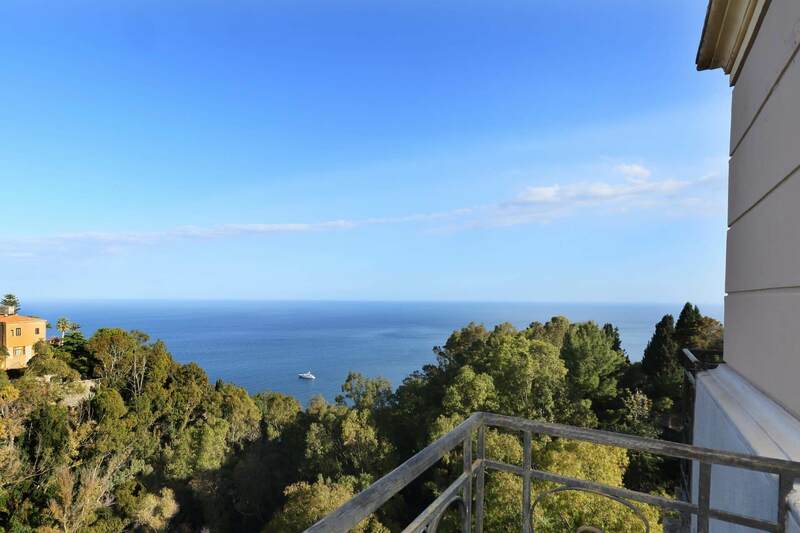 Single room with balcony, ideal for guests traveling alone, who want to take in the splendid view of Taormina. Booking the hotel directly with no extra middleman costs: this is the right choice for economically sustainable, good value, authentic and high-quality tourism. Nozio has selected this hotel because it offers you: - a high-quality Official Website where you can book at good rates due to no extra middleman costs; - great value for money confirmed by the real opinions of guests registered to the Nozio Community. 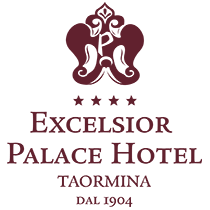 Excelsior Palace Hotel - Excelsior Palace Taormina s.r.l.